I went out of town this weekend, but that didn’t stop us from thrifting! We stopped at that indoor flea market I’ve bought from before and the Goodwill. I found a lot of vintage Corelle at the Goodwill; the tableware pieces that match some of the Pyrex patterns. I don’t collect Corelle, but I’m sure one of these days I’ll come across some of the pieces at such a low price (or maybe even free) that I won’t be able to pass up. The Goodwill also had an entire shelf of Ball and Atlas canning jars -which I love to find!… Except, they were all priced at $0.79! You can easily buy a brand new case at Walmart for $10-$12 (that’s for 12 jars) and that includes the bands and lids! Sometimes I wonder who prices the stuff at Goodwill. Anyway, on to the indoor flea market, which is similar to a antique shop. 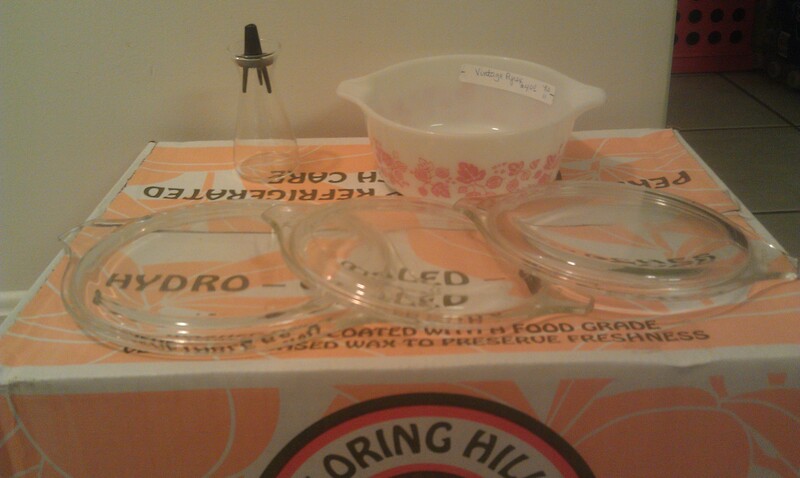 I found quite a few Pyrex turquoise butterprint and pink gooseberry casseroles, but they were so badly dishwashed. The lady saw me checking them out and offered to make a deal, but I told her that they were just too ruined for me to buy… especially at her prices! Newsflash to all vintage sellers: condition matters! Just because you have nice pieces doesn’t necessarily mean they are valuable, especially after you treated the pieces so badly for all those years. On to what I did buy… the same lady also had a pink on white Pyrex gooseberry casserole that is slightly washed out, but it’s more difficult to tell since the dish is white anyway. It had no lid and she wanted $4 for it. I got her down to $3 and I bought it because it’s my first decent pink piece and first of the gooseberry pattern. Another vendor has had these 3 Pyrex casserole lids sitting on the floor in front of his display for the past few months. Now that I have many of my own lidless pieces, I bought their 3 lids (2 different sizes) for $1 each. The one size fits the gooseberry casserole I also bought that day. And lastly, I spotted that salt/pepper shaker on a table and picked it up to admire its cuteness. It’s so tiny and adorable, isn’t it? Well, I bought it because it was only $0.05! 🙂 I love vendors like that! I’m not familiar with salt and pepper shakers at all. Mike suggested we use this little guy for cinnamon sugar. The shaker is all clear and completed solid, usually you’ll see ones with gold bands or flowers, but not here. The lid says Pyrex, but that’s all I know about it! I apologize for the blurry picture. I need to get a new battery in my camera, so this was taken with my phone. Also, all of my thrifty goodies are sitting on top of a box. Do you know what’s in that box? 25 pounds of peaches! 😀 We also stopped at a farmer’s market that day and the box of local peaches was $21.50, just $0.86/lb! I’ll be canning them all up tomorrow or the next day. If you’d like to help, feel free to stop by, but please bring some jars. Now it’s your turn… share with me your comments, thrifty finds, or anything! As I’ve mentioned before, this summer has been pretty busy for me! I struggle to find even a few hours each day to blog. 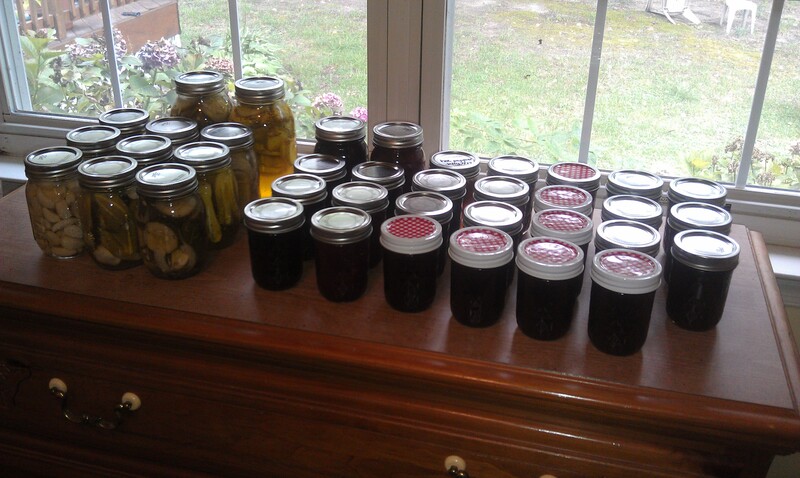 I spent a large part of last week picking produce and doing some canning. In total, Michael and I canned 8 jars of pickles (2 different varieties), 3 jars of pickled garlic, 23 jars blackberry jam, and 4 jars of blackberry peach. 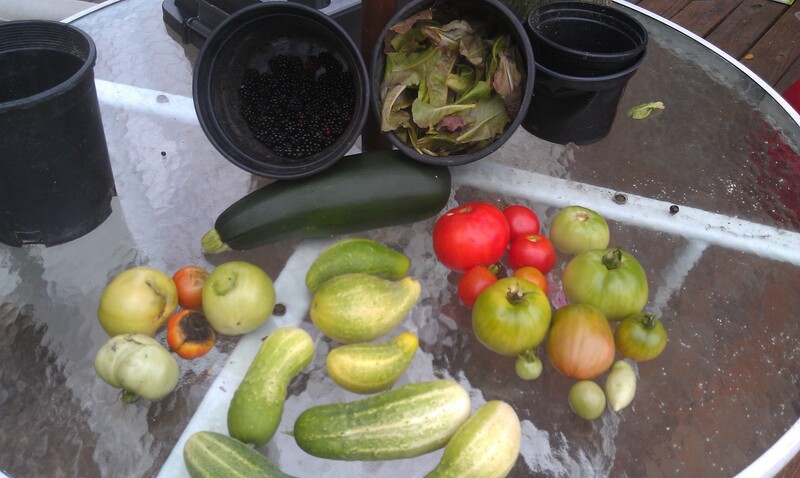 With the exception of the garlic, pretty much everything else was grown in my own garden or picked at a farm. It’s time consuming, but satisfying! 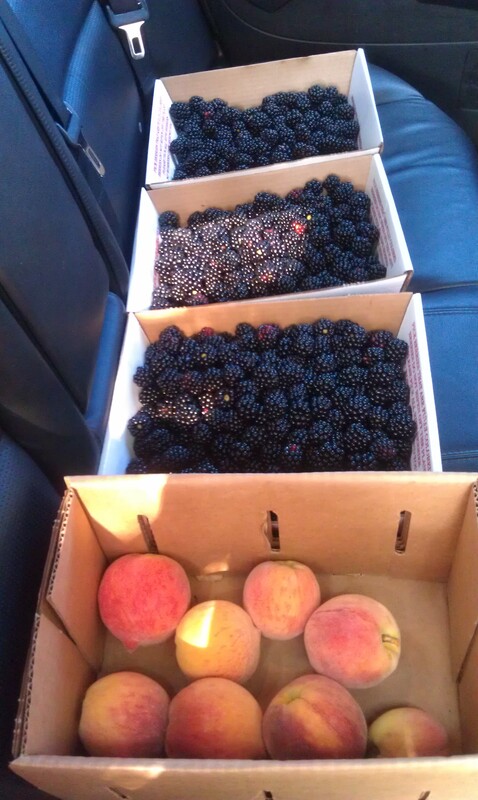 A lot of the blackberry jams are gifts for others. We also plan to make some apple butter in the fall. I need to get some new, cheap jars because I’ve used up almost every jar I own, besides a few quarts, and I HATE quarts. They are big, heavy, and I also struggle keeping them covered in enough water in the canner. I’m sure it’s a personal problem. Way too much stress -remind me to never buy anymore quarts. I should have learned my lesson last year. I’ve also been battling a fever, accompanied by lots of aches, pains, and fatigue, the last few days. I’m cannot wait to feel like my normal self again. It’s hard to sit with my warm laptop when my body is already over 100 degrees, you know? I move in to my apartment a month from today yesterday, woops. Basically the only thing I am excited about is organizing and decorating my cabinets and shelves with Pyrex and finding a new, comfy blogging niche. Since the apartment is costing a ridiculous amount (and because I am a savvy shopper!) I’m going to try my very, very best not to spend very much money on stuff for the apartment. I’m all about reusing what I have, fixing up old stuff, and buying cheap. Hopefully I’ll come across a few DIY projects to work on this month too. That also means that school is starting and I probably should be starting to buy textbooks (Actually, I always procrastinate until school starts..!) Fellow students, keep your eyes peeled for a post in the coming weeks about saving money on textbooks. I’m hoping Neebo with bring back their free textbook rental promo -we’ll just have to see! Lastly, if you have a shopping trip picture you would like me to share on my blog, please email brandi (at) savvystudentshopper.com. Make sure the picture is attached and you write out some of the great deal details. I’d love to showcase some of my reader’s trips since I have not been able to do a lot of my own shopping lately. My garden was left alone for the week when I went on vacation so it was not in the best shape when I got home! We had a nasty storm right before I left for the beach which knocked over part of my fence and it didn’t get fixed until just the other day. 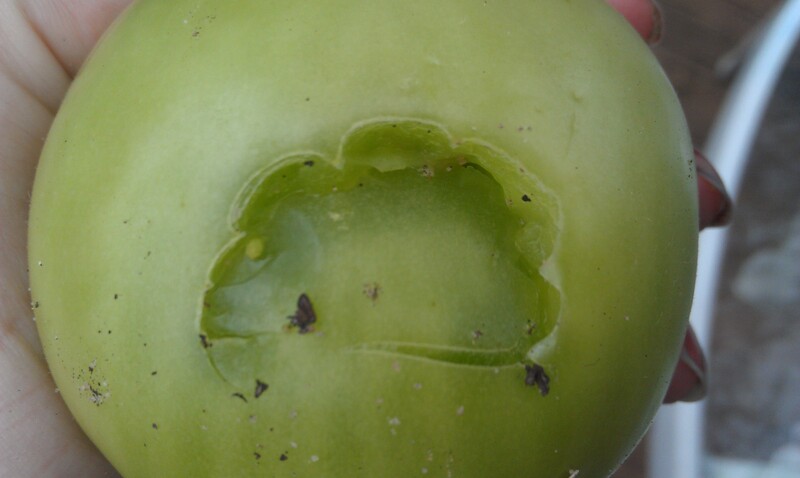 Unfortunately, the deer found their way back in and devoured a ton of tomatoes. They also like tossing green ones on the ground and also taking one bite out of tomatoes and leaving the rest for me. They also ate every single pepper and chewed the pepper plants down to the ground again. Stupid, stupid deer. See that? Why would they do that to 10+ tomatoes?! 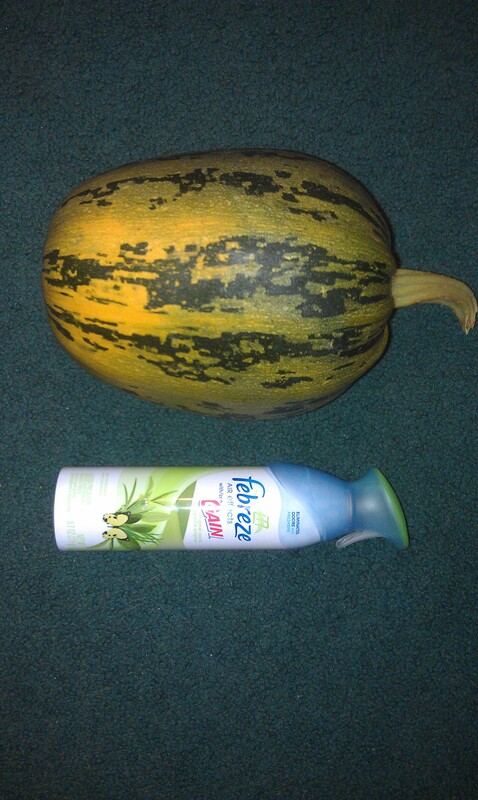 Now this squash thing isn’t from my garden, it was given to my mom at work. The lady has a huge farm on the eastern shore and brought in a ton of these… but she called them Spaghetti squash. It certainly doesn’t look like a Spaghetti squash to me though. Anyone else have an idea? 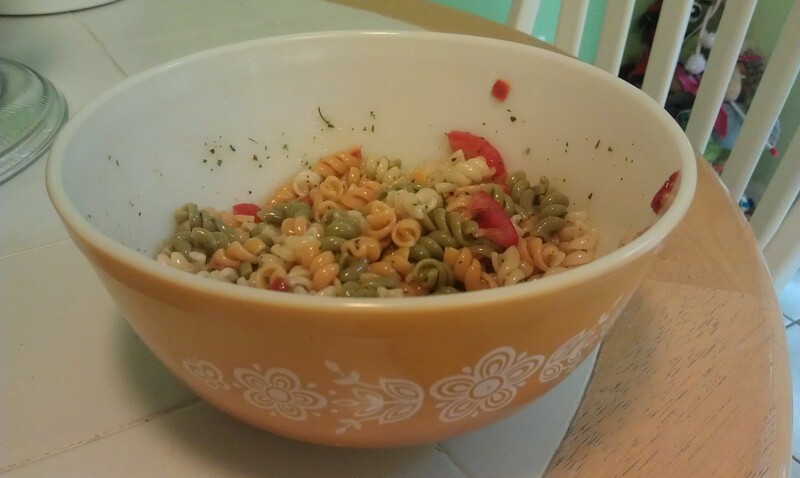 And the other night, I made some yummy pasta salad -complete with tomatoes from my garden (the few I saved from the deer, that is). And it’s served in a cute Butterfly Gold Pyrex Bowl. Apparently, this is my sister’s favorite pattern! It was my first piece (and it was free!) so it’s sentimental to me. I’ve been keeping the caterpillars off my cauliflowers leaves, but apparently they just found a new home INSIDE the cauliflower veggie. I’ll save you the details, but unfortunately, I will not get to eat any of it. 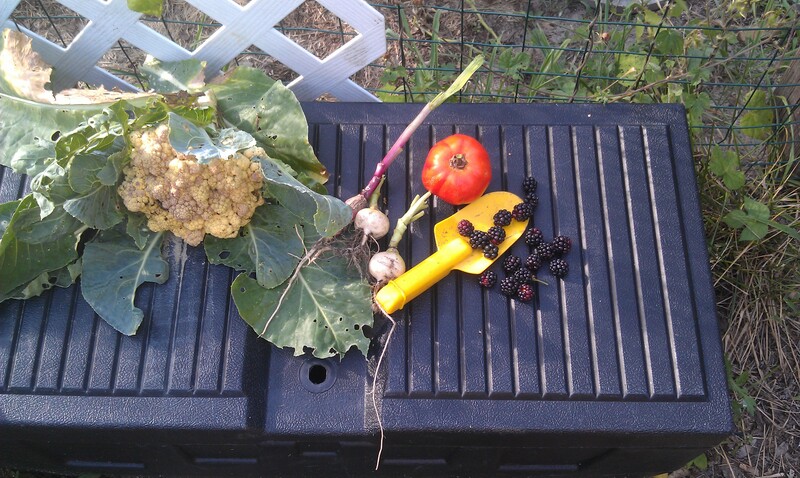 I picked the last of my radishes and lettuce. The deer also helped themselves to lettuce too. It’s like one giant salad bowl for them in there. Blackberries are coming to an end as well. I need to find a few new things to plant! 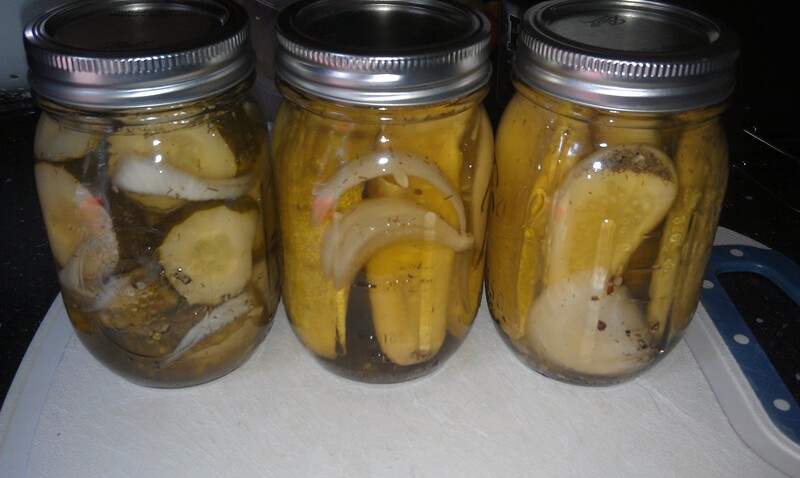 I made a few jars of pickles before vacation and I’ll make a few more with the rest of my cucumbers (way top picture). My cucumber plants are not doing well in all the heat we’ve had, so these will probably be some of the last cucumbers I get. 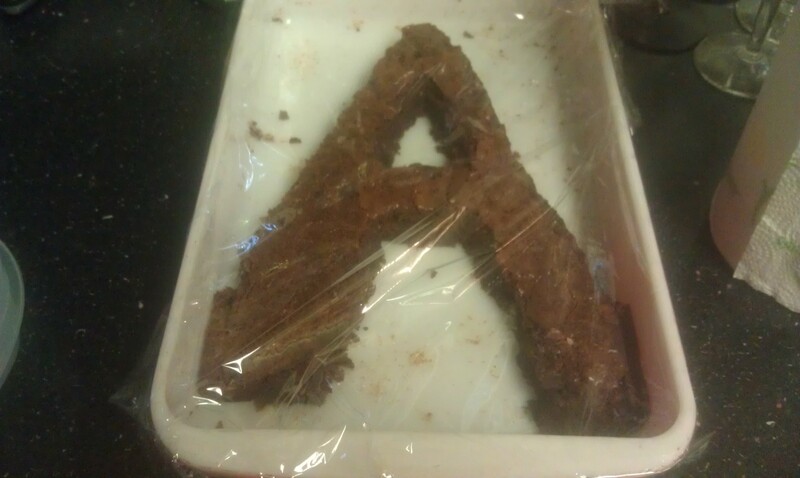 And then the rectangular brownie got cut into an “A”. 10 Gold Stars to the first person who can guess why my sister needed an “A” dessert last night! Any guesses? Due to the reason behind the “A”, my sister had some friends over last night. 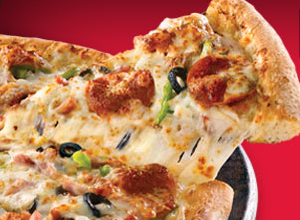 I cashed out some Papa Johns codes and scored them 2 Large Pizzas for $1.99 delivery + tip. I also fixed them up a salad, with lettuce and radishes (both garden fresh!). 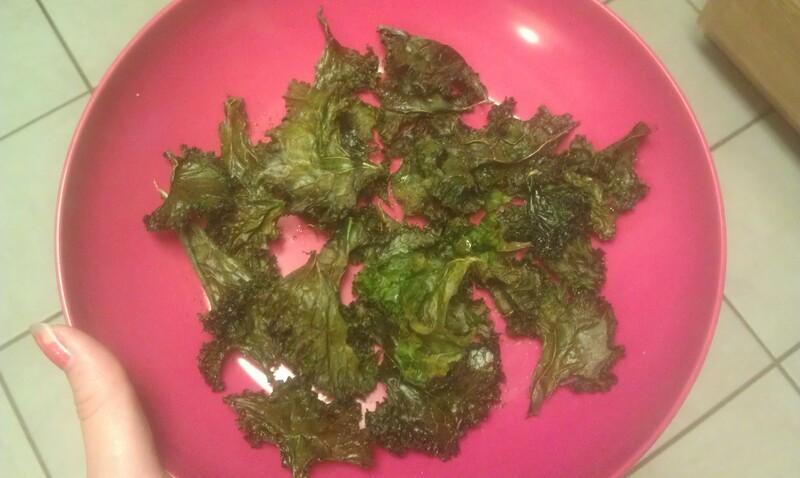 And because my sister’s favorite TV Show actress made Kale Chips a few weeks ago, we had to too. I know they are all the rave these days, I’m not too sure why. They weren’t terrible, certainly edible and crunchy though. So there’s a peek into my Tuesday night… fun huh? Happy Birthday Michael & KitKat Cake Idea! Today is Michael’s birthday! Michael’s my lovely boyfriend and tech boy for my site. Without him, this blog would not be here! I wanted to make Michael a fun cake because 1) he deserves it and 2) I love decorating cakes! I knew I was going to be super short on time so I needed to find a quick and easy way to make an awesome cake. I found one! It’s very, very simple. Assemble the cakes and frost the entire thing. 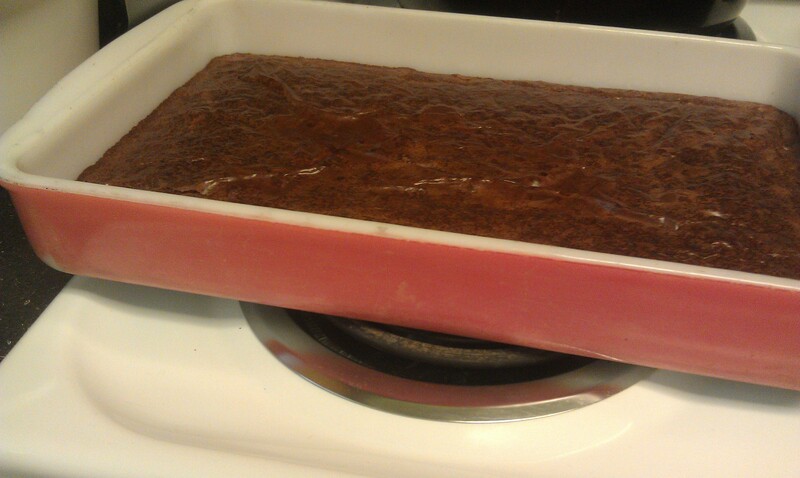 Then, break the KitKats up in sections of 2s and gently press them into the side of the cake. They should stick great to the frosting. Sprinkle the M&Ms all over the top of the cake until it’s covered. I used an entire bag. Tie with a ribbon if you want! It’s super easy and looks awesome! You could also change it around for the Holidays, for instance, using chocolate eggs and sitting them inside the “basket”. 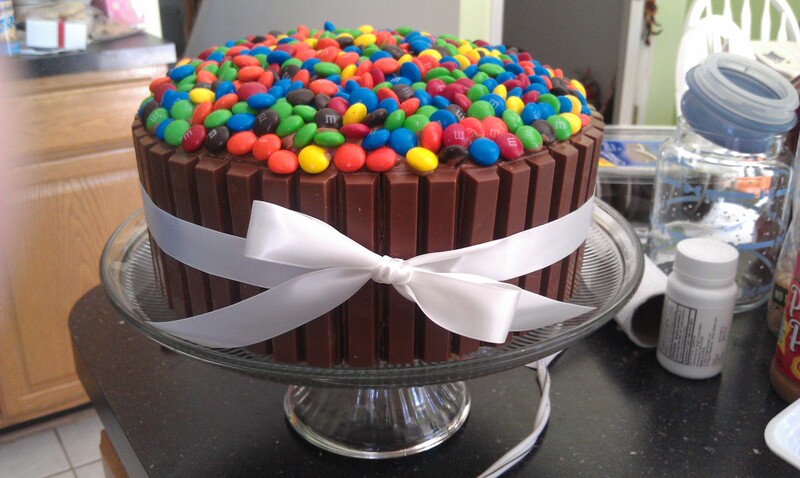 It is an expensive cake though (about $1/each for KitKats and $3 for M&Ms = $14 in decorations). If you are savvy and catch the sales and do the deals though it becomes more manageable. https://i0.wp.com/savvywifehappylife.com/wp-content/uploads/2012/03/IMAG1545.jpg?fit=3264%2C1952&ssl=1 1952 3264 Brandi https://savvywifehappylife.com/wp-content/uploads/2016/09/SavvyWifeHappyLife-logo-2.png Brandi2012-03-10 18:10:292012-03-10 22:50:33Happy Birthday Michael & KitKat Cake Idea! 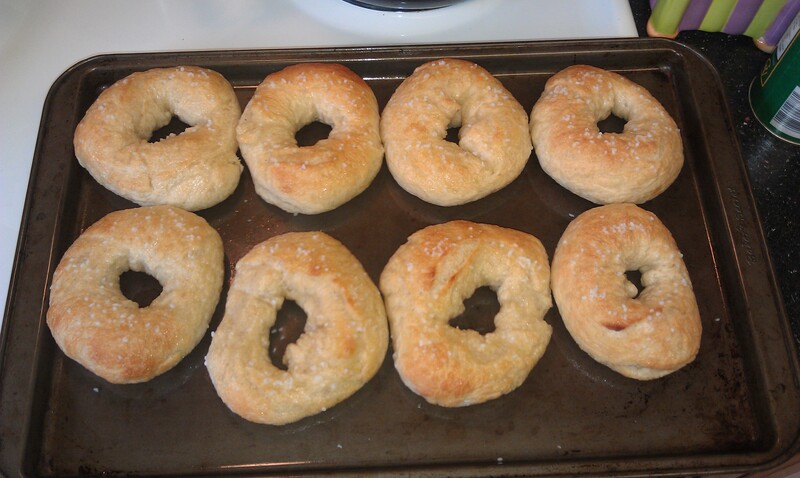 From My Kitchen: Homemade Bagels! I’ve posted about the bagels before, but I love seeing pictures of all the steps, so that’s what I have for you today. My mom BEGS for homemade bagels. BEGS. They are delicious, I’ll admit. I love Panera bagels, but these throw Panera out of the water. They are buttery, and crispy on the outside, and soft on the inside. Not to mention how WARM they are out of the oven. Is your mouth watering yet? I took the recipe from Recipes.com and tweaked it to my liking. Here’s what I use! Bread flour, sugar, salt, active yeast, and water. 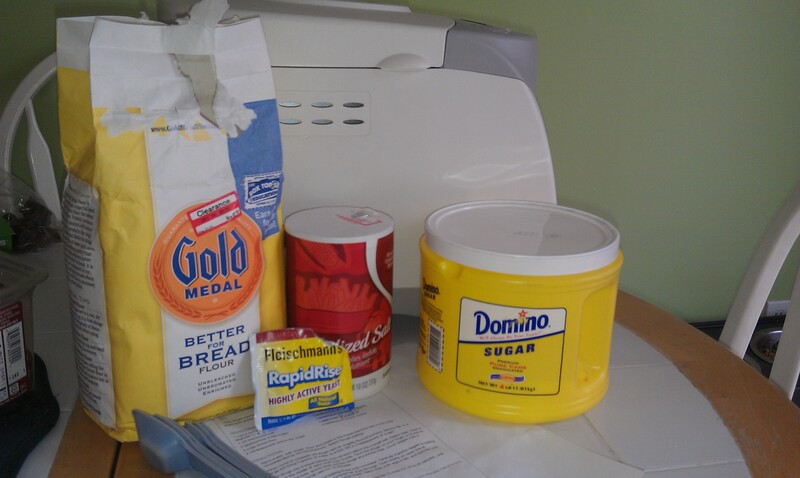 My bread maker is the Hamilton Beach 29881 HomeBaker Breadmaker -works awesome for me! And there’s the dough -fresh out of the bread maker. 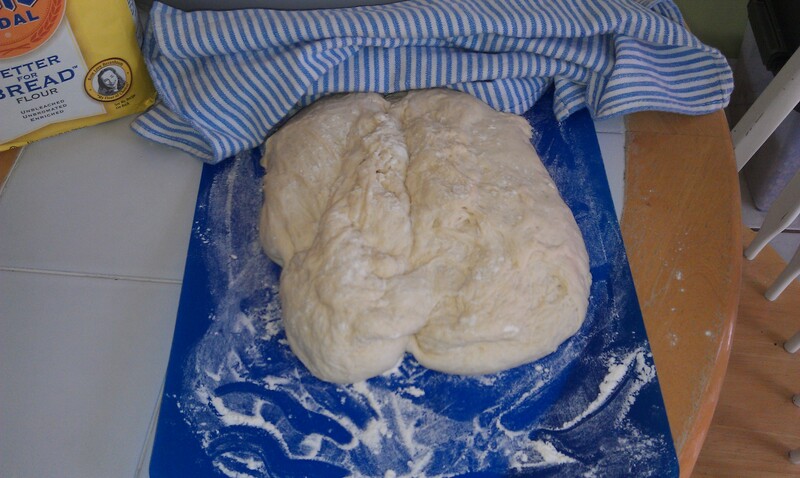 After letting the dough rise, you need to shape it into little bagels. 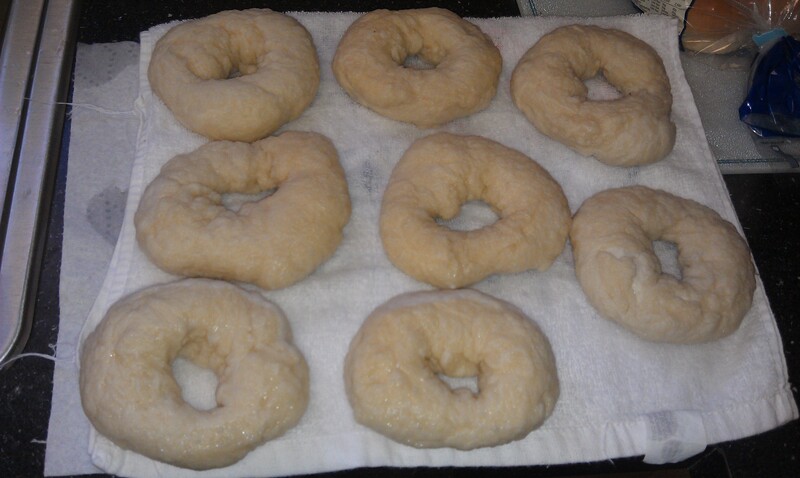 The recipe says you’ll get about 9 bagels out of the dough -I’ve NEVER gotten 9 bagels. I usually get 6-8, but maybe I like my bagels big 😉 Don’t worry about making extra, because they are really no good left over. Also, I’m sure your bagels will look better than mine. 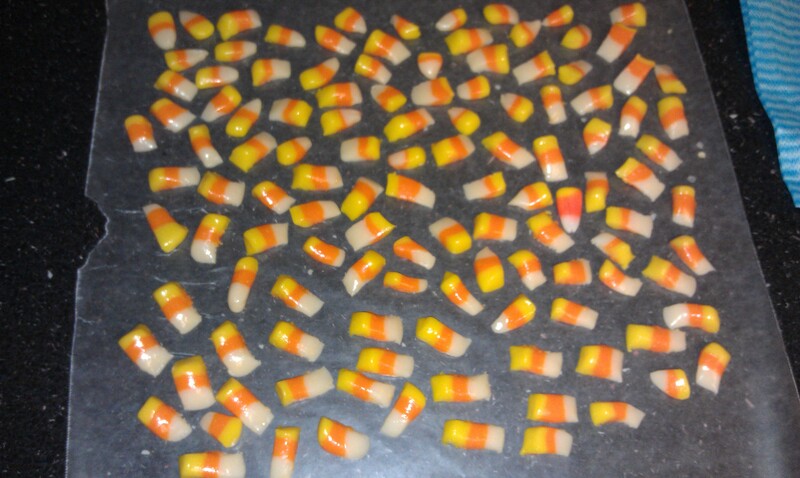 By this point, my family was begging for them to be done, so I whipped them together super fast! 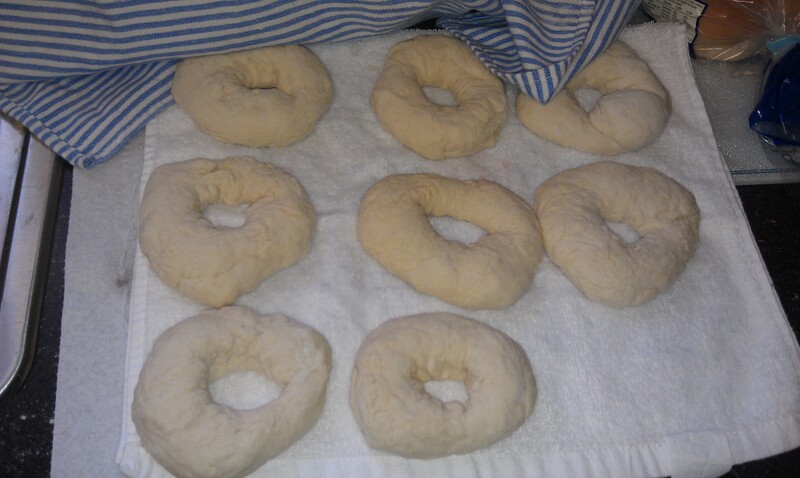 Here are the bagels after their bath! This is a very important step! I add a bit of baking soda for whatever reason. This step is where the bagels get their fluff. Instead of using egg to top them, I use melted butter and toss on some sea salt. Ahhh, and here they are! Fresh out of the over. Yum. Yum. Yum. Enjoy everyone! https://i2.wp.com/savvywifehappylife.com/wp-content/uploads/2012/02/IMAG1434.jpg?fit=3264%2C1952&ssl=1 1952 3264 Brandi https://savvywifehappylife.com/wp-content/uploads/2016/09/SavvyWifeHappyLife-logo-2.png Brandi2012-02-13 10:00:352012-02-13 00:24:05From My Kitchen: Homemade Bagels! Maybe I’ll make something yummy tomorrow after hitting up some stores! They are calling for snow tomorrow, in October! It’s crazy :O And I hate the cold so much! And I also wanted to share these pictures of Squirt and Lucy. They’ve both found a new spot to sit/sleep while we work in the kitchen. The pictures were taken within hours of each other. Aren’t they so cute?? 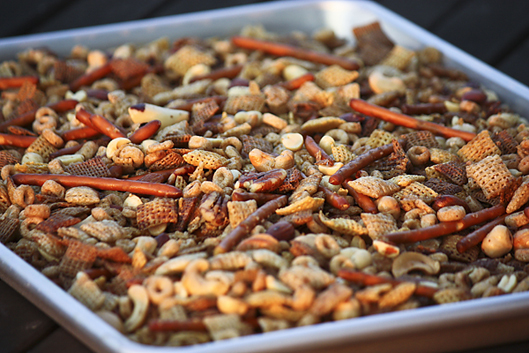 I came across this neat recipe where you can make your Chex Mix in the crock pot! I know many of you moms are in love with you crock pot, and you really should be because they’ll make every thing, even Chex Mix! Whisk together vegetable oil, Worcestershire sauce, seasoned salt and garlic powder and pour over cereal mixture. Mix well.